Dr. Jon Mackey is certified by the American Board of Internal Medicine. His clinical interests include preventive medicine and management of chronic diseases. Dr. Mackey attended Michigan State University for both his undergraduate and graduate degrees. 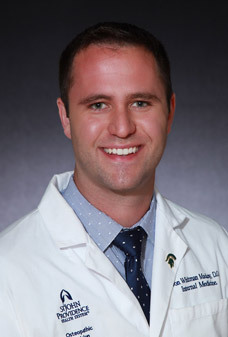 He completed his residency at St. John Macomb-Oakland ... Read More Hospital with his final year as Chief Resident with a focus on quality improvement. Dr. Mackey has experience in treating both acute and chronic conditions inside and outside of the hospital setting with offices located in Warren and Center Line, Michigan. He is passionate about both primary and secondary prevention of disease and improving the health and quality of life in all patients.